Meet Akhilandeshwari aka Akhila. 45 years old, spinster, an income tax clerk, a daughter, a sister, the only provider for the family after her father died. She has played all the roles all her life but she has never been herself. One day, she decides to shed off all responsibilities and buys a one way ticket to Kanyakumari, the southern most part of India, to be away from all the people she had known all her life, to find the ‘Akhilandeshwari’ which was lost somewhere in the midst of duties and responsibilities. She travels in an all female coupe where she meets five other women, each of whom has a story to tell. These stories changes the way Akhila thinks and that changes her life. The stories are all an attempt to answer Akhila's problematic question: Can a woman stay single and be happy at the same time? 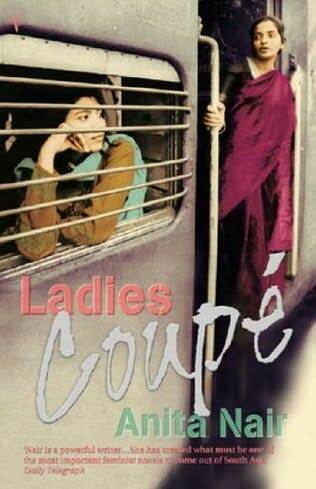 In this novel, Anita Nair has tried to dwell on the complex issue of women's freedom in a male dominated Indian society, her dreams, desires and her needs. Although, I could not bring myself to connect with all the stories the women in the coupe tells Akhila, I can very well understand the plight of women who suffers because society does not see them at par with their male counterparts and it is always them who has to compromise with their aspirations. I found the whole premise scary, in the sense that it was depressing at times - women suffering the brunt of the rigid society. The end of the novel was somewhat uplifting, when Akhila comes in terms with her life, she knows what she wants of her life. The confidence she radiated was exhilarating. To me, the author has left what happened there after to the reader's imagination. What I could not comprehend was, how someone could pour out their life story to a stranger in an over night train journey. One of them telling about her life is possible but when all five of the fellow passengers are so forth coming with their life story, you know it is part of fiction. However, the book made me ponder over how so many times women consider living is mere existence. It made me realize that a great deal inner strength is needed to break free of the bonds of relationships be oneself and be in charge of one's life. A full blown chick lit book that will take you on a ride of deep introspection. i think it's unfair to categorize this buk as chick lit...ofcourse ts abt women,but unlike the conventional chick lit ones, this was something meaningful...! Not the type of book I usually read, but you've caught my attention. And to be honest I just don't know much about life in India, so it would be an interesting look into that culture, but also seems universal too. Thanks for the review.